Airing My Laundry, One Post At A Time...: Mickey's Not So Scary Halloween Party Tricks and Tips! 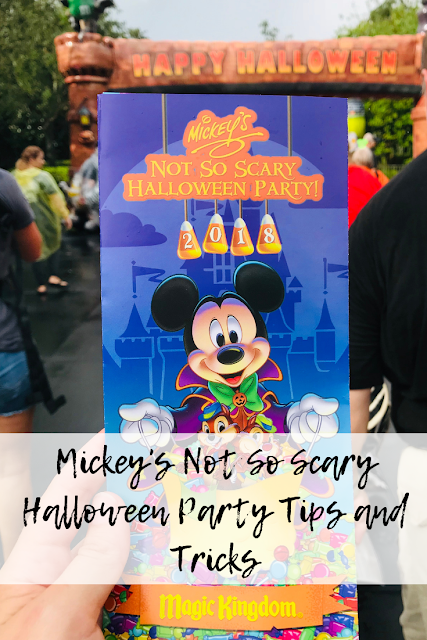 Mickey's Not So Scary Halloween Party Tricks and Tips! We went to our first Mickey's Not So Scary Halloween party at Walt Disney World in early October. October 9th to be exactly, a Tuesday. I thought it would be less crowded, but it really wasn't. There were lots we didn't get to see and do (we didn't even make it to Frontierland!) but we did accomplish a lot. Yes, you pay extra to go on select nights, and I highly recommend you purchase ahead of time because some parties do sell out. I have some tips and tricks if you decide to go. Heck, we need to go back another time, which probably won't happen for many years, but it's a goal so we can do the things we didn't get to. 1. Wear a costume! My daughter was Eleven from Stranger Things, and my son was Rick from Rick & Morty. Make sure it's comfortable though. There is a lot of walking. Ladies, you don't need fancy shoes to go with a costume. My kids just wore sneakers, and so did I. Also, please note that people 14 years old and older cannot wear a mask. I was just the one paying for it all, hence my t-shirt. 2. Try out the Halloween foods! There are some that are only available during the Halloween party. 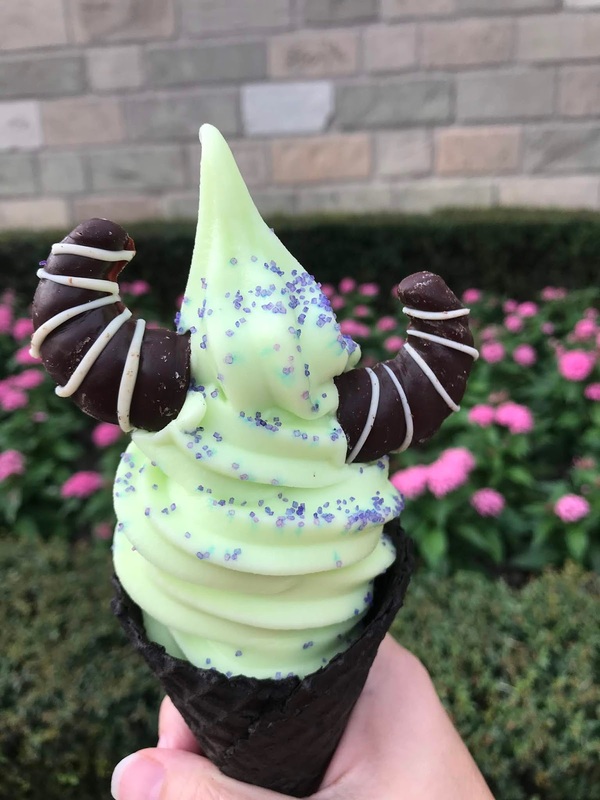 The Maleficent ice cream cone found at Storybook Treats. It's made with lime sorbet and is put in a cookie cone. The horns are chocolate. This was a win for us all! If you like lime desserts, you'll probably like this. This is the not so poison apple cupcake found at Starbucks. It was delicious. The cupcake is cinnamon apple flavored, and there is TONS of buttercream frosting. Almost too much for me though. I would get ONE and share it. This is the Candy Corn Milkshake found in Tomorrowland at Auntie Gravity's Galactic Goodies. It comes with cotton candy on top, plus a Mickey Mouse marshmallow. The shake tasted more like vanilla to me, and there was LOTS of it. Again, just get one! 3. You can go through the candy lines as many times as you want! Seriously. If you have an allergy, don't worry, there are special allergy free options around the park. 4. The parade is at 915 and 1115. Generally the later parade is less crowded, so go for that one. 5. Go on the rides! We walked right on the People Mover. The wait for Space Mountain was longer though, about 35 minutes. We also did the Speedway, which was 25 minutes. Buzz Lightyear was 20 minutes. I would have preferred 15 minutes or less lines, but as I mentioned, there seemed to be a lot of people. 6. Purchase the Oogie Boogie Popcorn Bucket! It's only available at the party. We bought ours at the red popcorn stand by the castle. He is now sitting on our bookshelf and fits right into the Halloween decor. 7. Do NOT waste party time by booking a reservation at a restaurant. Go for a quick service meal. We ate at Pecos Bills. Also, decide if the Halloween fireworks are important enough to see. If not, skip them. All the lines will be short! We decided to watch them only because it was our first halloween party, but if we go again, we'd skip them. It's a cool show, but nothing we HAVE to see again. 8. The party starts at 7 but you can show up at 4. Follow the signs for the first trick or treat stop. Yes, it'll be open at 4, and there are cool photo ops. This is also a great time to have dinner so you're not missing party time. 9. 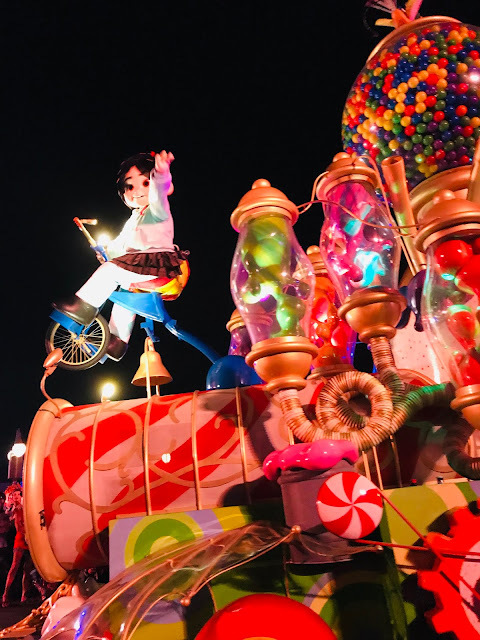 Check out the 1045 Villain Spooktacular Show near the castle, and then stay in that area for the 1115 parade. We stood on a curb and when the show was over, we just plopped right down for the parade. 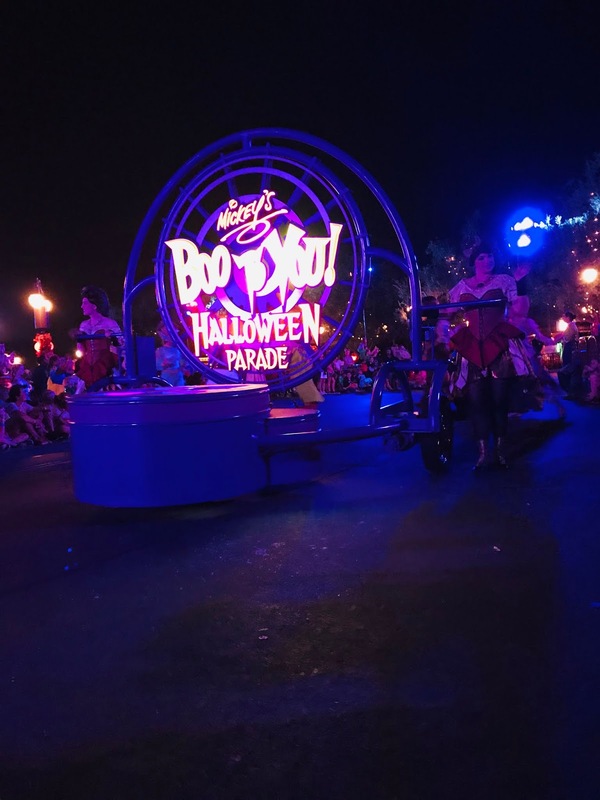 Do not give up that curb spot because people will swarm after the spooktacular show. Some people tried to push us off, but we refused and sat our butts right down. 10. It WILL get crazy as soon as a parade ends. Hoards of people will be heading for the exit. Instead of getting stuck there, head to a store! We popped into the confectionary until the crowds thinned out. My son found a treat! We did enjoy our time at the party, but we didn't feel like it was enough time. 7-12 sounds and looks like a lot, but it goes fast! If you can, I highly recommend going more than once. We didn't even get to see any of the characters because those lines were generally over an hour. But we did get some Magic Shots! There are PhotoPass castmembers throughout the park who can do them. But again, the lines could get long so we didn't get as many done as we'd like. Also, yes, you do get TONS of candy. This was my bag, and my daughter's. My son was worried I'd take some of his candy so he didn't want me to mix his with ours. 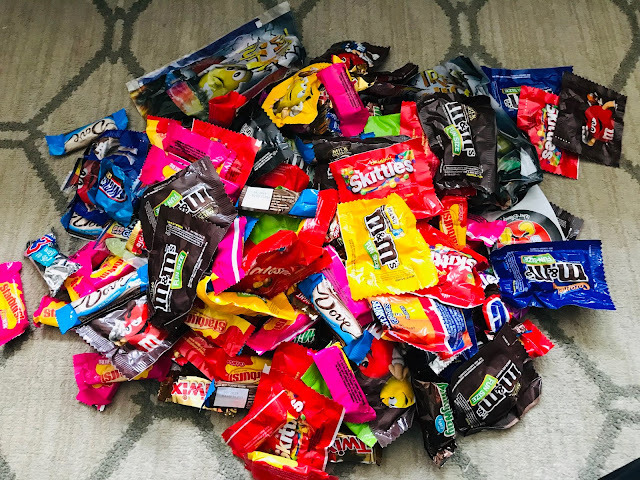 If you are flying, I recommend putting the candy in the suitcase because security will go through food items and you don't want to get held up. Plus, it's good candy, not that cheap stuff! 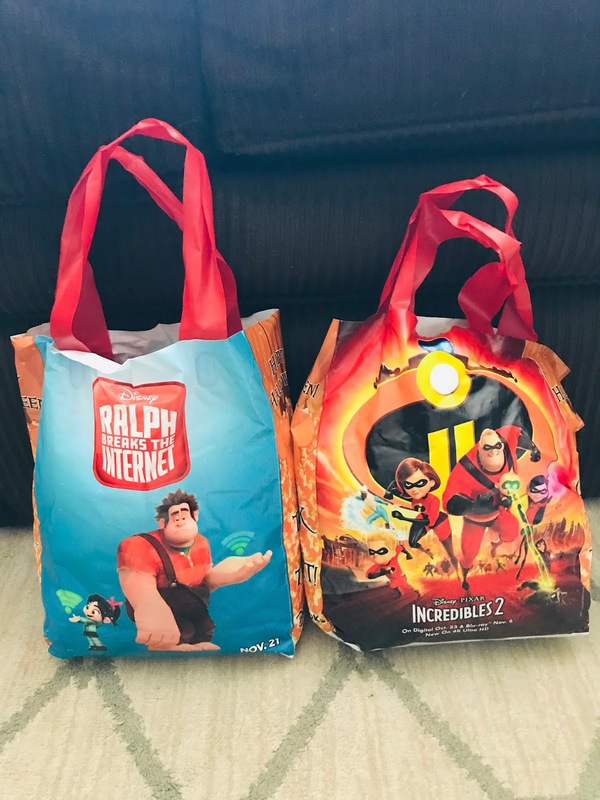 And yes, you CAN get more than one bag. 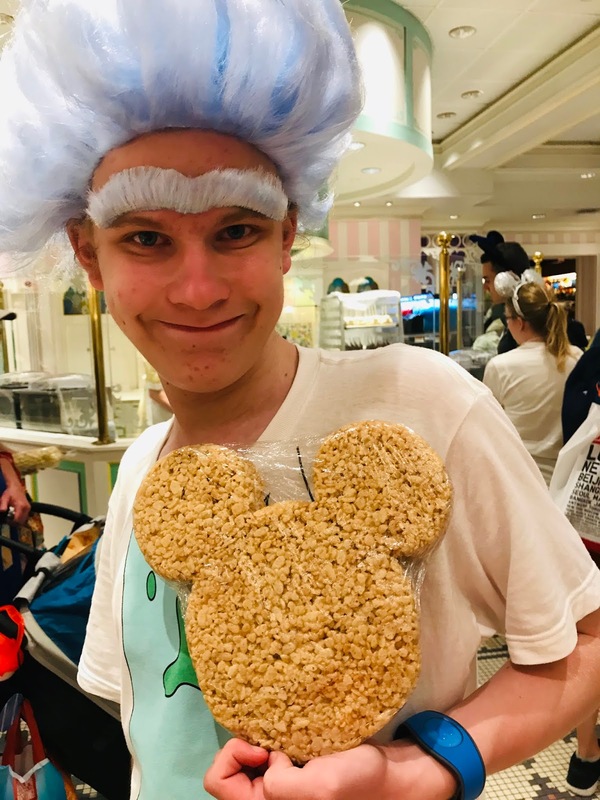 Most of the castmembers at the beginning of the candy spots have them. Or bring your own bag! 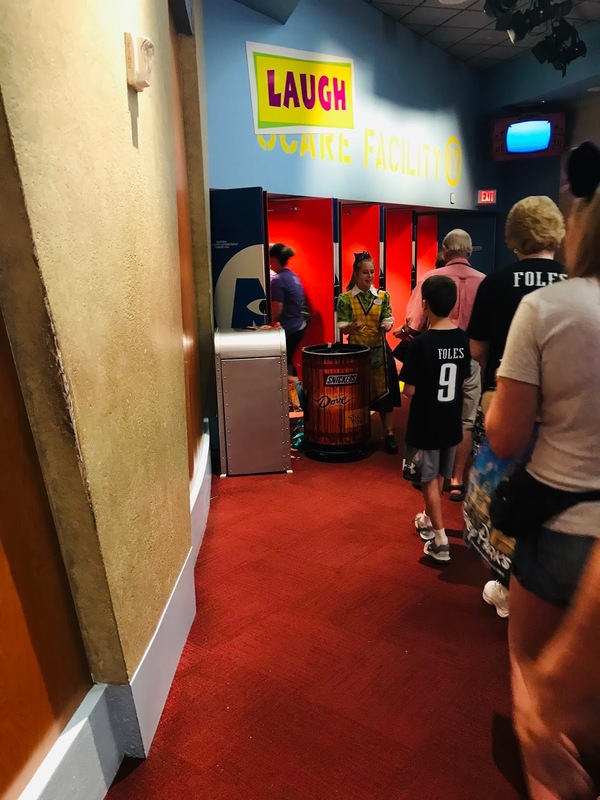 Remember: you can go through the candy lines as much as you want. Load up! 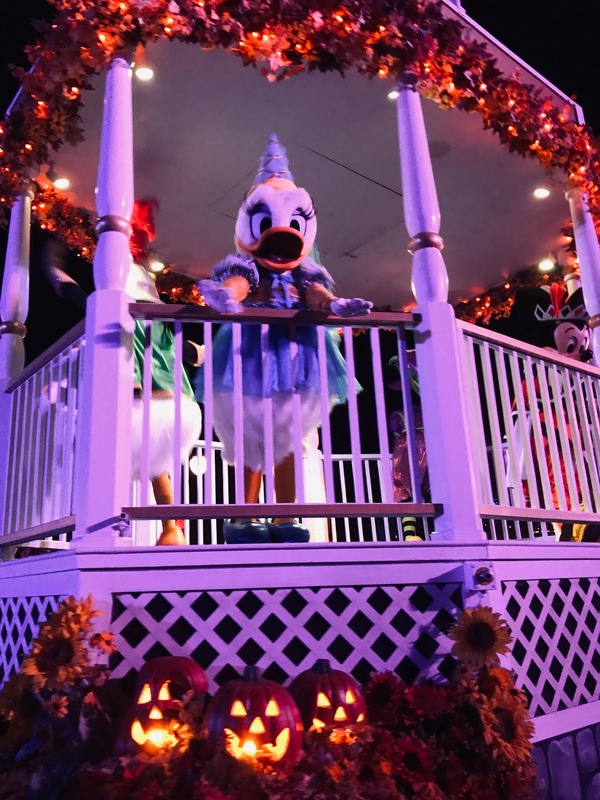 Have you ever been to Mickey's Not So Scary Halloween Party? Oh my goodness, that IS good candy. This is another dream of mine. The costumes! The food that you can only get then! Ahhhhhhh! This is super duper cute. I love halloween. And I love anything that is scary but this one was sweet. This looks like so much fun!!! I haven't been to Disney in almost 20 years. That candy corn milkshake looks yummy. I LOVE candy corn. That looks amazing, such great candy and fun photo opps! Oh wow! 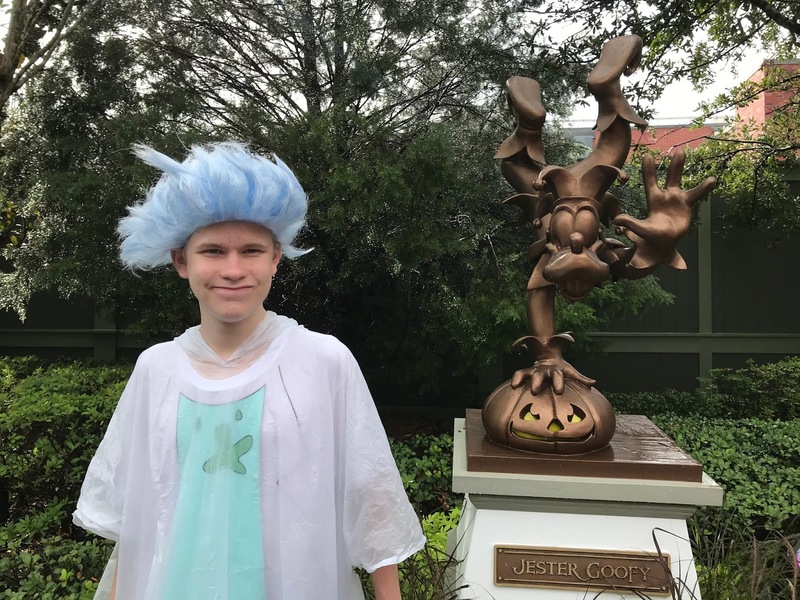 Halloween in Disney is definitely a lot of fun and magical. That looks like so much fun! I love all the decorations and lighting. What's really impressing me the most is that food, though. Om nom nom. You always go all out for your kids and take them to the best places to have fun. Have to wear a costume and join in full force. I can imagine how Disney does Halloween. I just picked my boy from a Halloween dance, let's just say it's getting creepy. I love how Disney does all holidays! They hold nothing back! I love it! 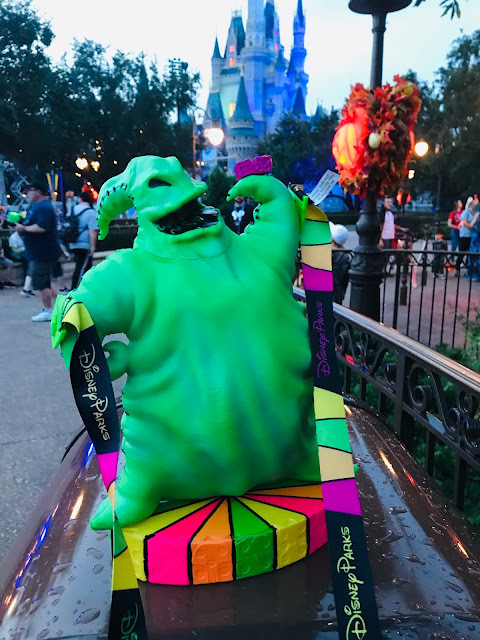 I would love to explore Disney at halloween that has to be a blast! OMG that EGGO purse. That's hillarious. Great photos and looks like you all had a great time. Great tips! We have never been for Halloween. We are headed to Disney in Jan for the marathon. You are always having a great time with your kids! I love all the decorations and lighting. We love Halloween and would love to go during this event. We always find ourselves there in the spring. I think we need to plan next year. The Maleficent ice cream cone looks amazing!! I also love that they are so candy friendly! My kids would love this. What a fun way to celebrate Halloween. This sounds like such an awesome event. I'm sure my girls would have such a blast here. Looks like fun for adults too! Looks like so much fun! I have been wanting to go, as I use to work for Disney and had scheduled tones of these events for guests. Thank you for letting us into your time. 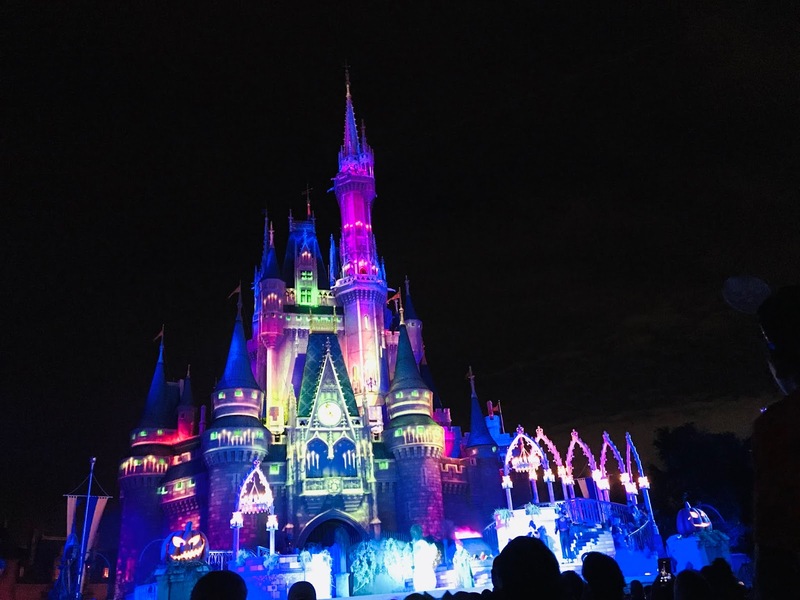 I would love to visit Disney on Halloween. This looks like such a wonderful experience. It looks that you guys had have a great time. 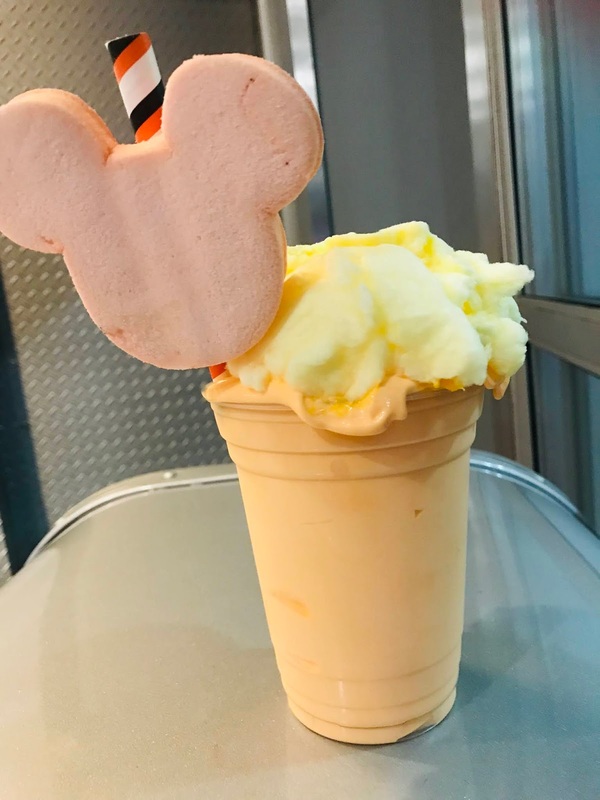 Candy corn milkshake looks so delicious. 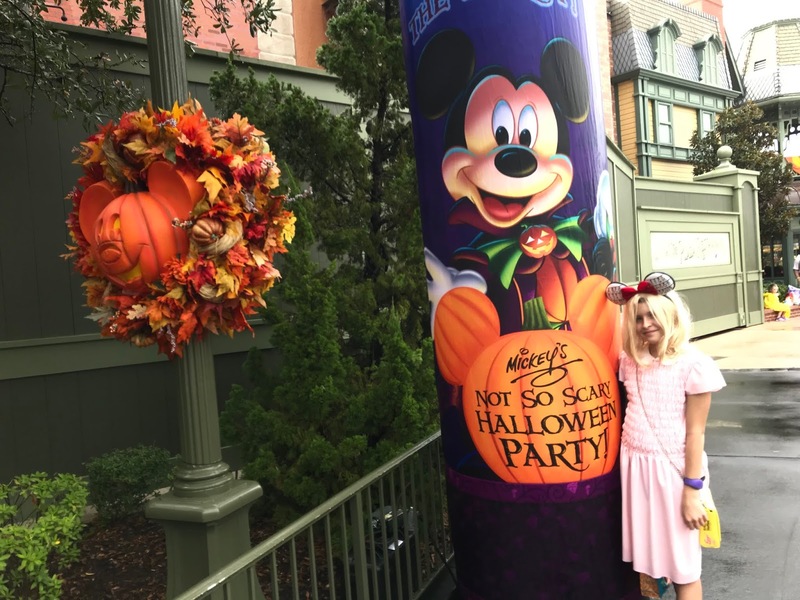 My kids would love Mickeys-not-so-scary halloween party. I've seen several not so scary Halloweens and everyone seemed to be having fun! 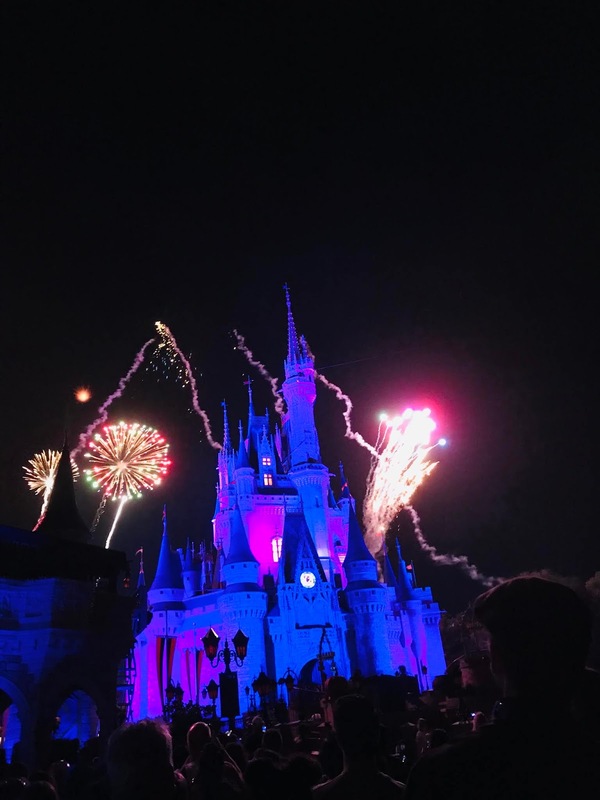 I like the tips about the fireworks and not booking reservations. Great time savers! I have a friend there now. I am emailing her your post. 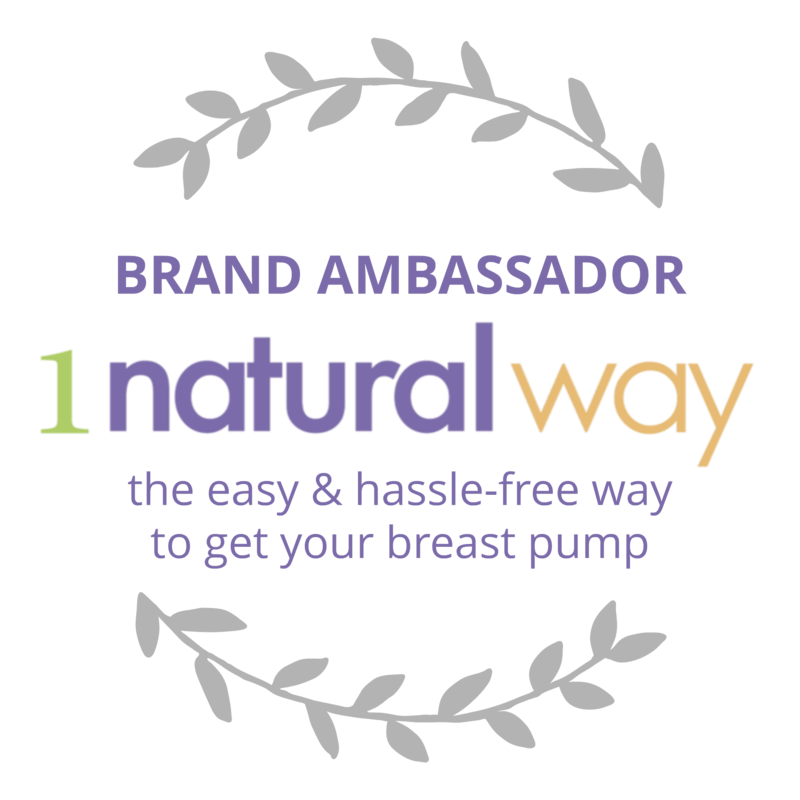 There are a lot of good tips here! This looks like it would be so much fun. I'm sure my kids would love it!! And I love your shirt!! Haha. I've only been to the park twice and once it was during Halloween. It was so much fun. Your photos make me want to go back. 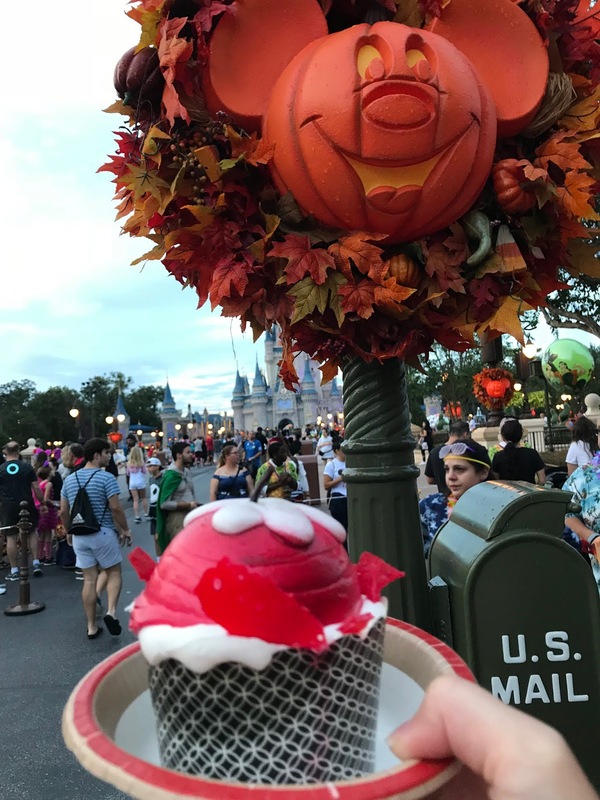 I never been to Disney during Halloween, but would love to go! Looks like so much fun without all that scary stuff. Wow! 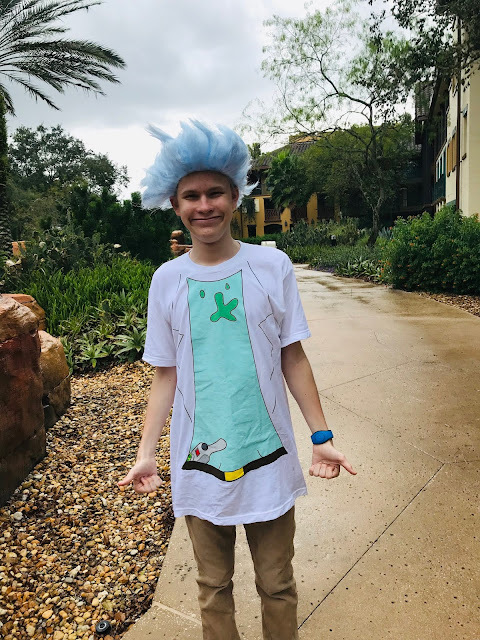 Disney has some great Halloween parties. The ice cream looks delish, the costumes are great. Thanks for all the useful tips! That ice cream looks so good! It seems like you all had a wonderful time! That looks like so much fun. I've never been to Disney before. I hope to go with my kids one day. I love all things Disney! I wish this had been available many years ago when my kids were young. This looks like a really fun trip. I used to live near there, and never went - even though I really wanted to. Life just kept getting in the way at the time, but now that I have a daughter of my own I want to go even more. This would be perfect for her because she is still very young, and we can't do scary things. I need to budget this out for next year, thanks for the tips! Definitely on BB's bucket list! Waiting till all 6 Grands will remember the visit- and to save up money to eat all those goodies- WANT THEM ALL!!! Thanks for the tips, will be using them for sure. The kid in me wishes to visit Disney too! I love how they glam up the theme park depending on the holiday season. Also, now you just look like their sister. I love Natalies sling bag too! I would like to take my kids to Disney too. May be next year. That I ice cream cone looks delicious. Thanks for sharing wonderful places. Hahaha! I gotta love the T-Shirt. Although I was crazy enough to dress up when I used to go with my daughter. I think the last time I went I was Mickey Mouse. And the time before that I was Dr. Doofenschmirtz. Had a great time though. 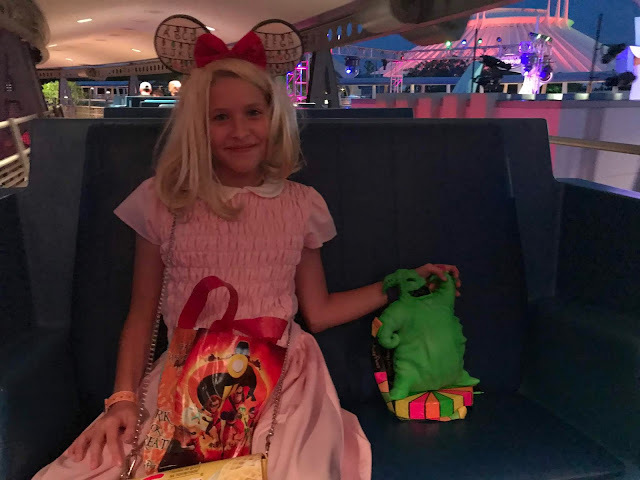 I have had a halloween party at disneyland a few years back and what a blast! those costumes are so great! love rick & morty! Awe this looks like such a fun time!! I wish we lived closer to the Disney parks! I haven't but would really want to! Sounds like an event I would not want to miss. Love all the candies and your costumes! I think this would of been a fun way to celebrate the Halloween season! 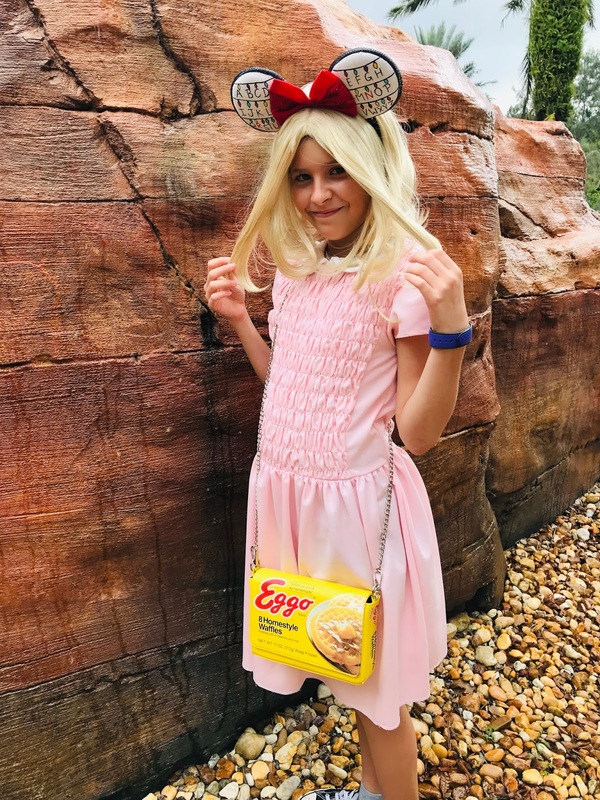 I loved the Eleven costume and that Eggo purse was perfect!